Reproduced from an original watercolor, this poster is signed by the artist. The image measures inches. All of my posters are rolled and sent in a substantial mailing tube. 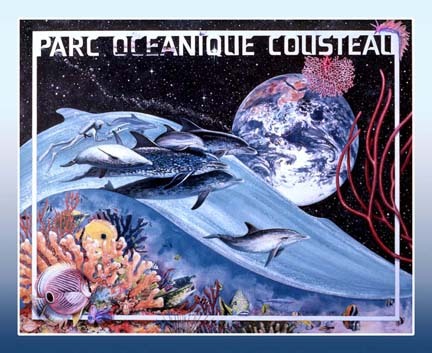 In 1989, the Cousteaus opened their marine education park in Paris, France. The logo for the park, showing a whale with Captain Cousteau’s profile in it’s tail, was my design. This image and others were exhibited at the Paris Marine Art Expo.